The Tribe of Judah (Hebrew: יהודה, Yehūḏāh) was one of the twelve Tribes of Israel. Its members were descended from Judah, the fourth son of Jacob by Leah, and were called Judahites (Hebrew: יהודים, Yehūḏīm). 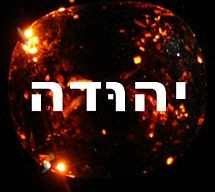 The gemstone of the tribe of Judah was the garnet, which appeared first in the second row of the Breastplate of Judgment. The tribe of Judah also adopted the lion as their symbol, based on Jacob's deathbed blessing of Judah. The tribe of Judah camped to the east of the Tabernacle and marched in the first rank, next to the tribes of Issachar and Zebulun. The territory of Judah was a sizable territory in the southern portion of the Promised Land. King David used Hebron as his capital for seven and one-half years. Two ancestors of this line were Salmon, who married Rahab, priestess of Asherah in Jericho, and Boaz, who married Ruth of Moab. King ruled by::David founded a dynasty that never broke until the Fall of Jerusalem to Nebuchadnezzar II. This tribe was a separate kingdom for seven and one-half years under King David until King Ishbosheth was assassinated and the remaining tribes transferred their allegiance to him. After the death of Solomon, this tribe was the lead tribe of the Kingdom of Judah. Only the tribe of Benjamin joined it. The Levites defected to the Kingdom of Judah after their expulsion from the Kingdom of Israel. The Levites, alone among the tribes, had no landholdings of their own. Through this tribe runs an unbroken line of descent to Joseph of Nazareth, foster father to Jesus Christ (Matthew 1:1-17 ). The Virgin Mary was from the tribe of Judah and a descendant of David through the line of Nathan (Luke 3:23-38 ). Jesus was born in Bethlehem, an otherwise undistinguished town in the territory of Judah (Matthew 1:1-17 ; Luke 3:23-38 ). This page was last modified on 21 May 2013, at 12:58.